These highlights do not include all the information needed to use ESBRIET safely and effectively. See full prescribing information for ESBRIET. To report SUSPECTED ADVERSE REACTIONS, contact InterMune at 1-888-486-6411 or FDA at 1-800-FDA-1088 or www.fda.gov/medwatch. ESBRIET is indicated for the treatment of idiopathic pulmonary fibrosis (IPF). Conduct liver function tests prior to initiating treatment with ESBRIET [see Warnings and Precautions (5.1)]. The recommended daily maintenance dosage of ESBRIET is 801 mg (three 267 mg capsules) three times a day with food for a total of 2403 mg/day. Doses should be taken at the same time each day. Patients who miss 14 or more days of ESBRIET should re-initiate treatment by undergoing the initial 2-week titration regimen up to the full maintenance dosage [see Dosage and Administration (2.2)]. For treatment interruption of less than 14 days, the dosage prior to the interruption can be resumed. If patients experience significant adverse reactions (i.e., gastrointestinal, photosensitivity reaction or rash), consider temporary dosage reductions or interruptions of ESBRIET to allow for resolution of symptoms [see Warnings and Precautions (5.1, 5.2, 5.3)]. Discontinue confounding medications, exclude other causes, and monitor the patient closely. Repeat liver chemistry tests as clinically indicated. The full daily dosage may be maintained, if clinically appropriate, or reduced or interrupted (e.g., until liver chemistry tests are within normal limits) with subsequent re-titration to the full dosage as tolerated. Do not rechallenge patient with ESBRIET. Reduce ESBRIET to one capsule three times a day. With use of ciprofloxacin at a dosage of 750 mg twice daily, reduce ESBRIET to two capsules three times a day. Capsules: 267 mg, white, hard gelatin capsules printed with “InterMune®” and “267 mg” on the cap of the capsule in brown ink. Increases in ALT and AST >3 × ULN have been reported in patients treated with ESBRIET. Rarely these have been associated with concomitant elevations in bilirubin. Patients treated with ESBRIET 2403 mg/day in the three Phase 3 trials had a higher incidence of elevations in ALT or AST ≥3 × ULN than placebo patients (3.7% vs. 0.8%, respectively). Elevations ≥10 × ULN in ALT or AST occurred in 0.3% of patients in the ESBRIET 2403 mg/day group and in 0.2% of patients in the placebo group. Increases in ALT and AST ≥3 × ULN were reversible with dose modification or treatment discontinuation. No cases of liver transplant or death due to liver failure that were related to ESBRIET have been reported. However, the combination of transaminase elevations and elevated bilirubin without evidence of obstruction is generally recognized as an important predictor of severe liver injury, that could lead to death or the need for liver transplants in some patients. Conduct liver function tests (ALT, AST, and bilirubin) prior to the initiation of therapy with ESBRIET in all patients, then monthly for the first 6 months and every 3 months thereafter. Dosage modifications or interruption may be necessary for liver enzyme elevations [see Dosage and Administration (2.1, 2.3)]. Patients treated with ESBRIET 2403 mg/day in the three Phase 3 studies had a higher incidence of photosensitivity reactions (9%) compared with patients treated with placebo (1%). The majority of the photosensitivity reactions occurred during the initial 6 months. Instruct patients to avoid or minimize exposure to sunlight (including sunlamps), to use a sunblock (SPF 50 or higher), and to wear clothing that protects against sun exposure. Additionally, instruct patients to avoid concomitant medications known to cause photosensitivity. Dosage reduction or discontinuation may be necessary in some cases of photosensitivity reaction or rash [see Dosage and Administration (2.3)]. In the clinical studies, gastrointestinal events of nausea, diarrhea, dyspepsia, vomiting, gastro-esophageal reflux disease, and abdominal pain were more frequently reported by patients in the ESBRIET treatment groups than in those taking placebo. Dosage reduction or interruption for gastrointestinal events was required in 18.5% of patients in the 2403 mg/day group, as compared to 5.8% of patients in the placebo group; 2.2% of patients in the ESBRIET 2403 mg/day group discontinued treatment due to a gastrointestinal event, as compared to 1.0% in the placebo group. The most common (>2%) gastrointestinal events that led to dosage reduction or interruption were nausea, diarrhea, vomiting, and dyspepsia. The incidence of gastrointestinal events was highest early in the course of treatment (with highest incidence occurring during the initial 3 months) and decreased over time. Dosage modifications may be necessary in some cases of gastrointestinal adverse reactions [see Dosage and Administration (2.3)]. The safety of pirfenidone has been evaluated in more than 1400 subjects with over 170 subjects exposed to pirfenidone for more than 5 years in clinical trials. ESBRIET was studied in 3 randomized, double-blind, placebo-controlled trials (Studies 1, 2, and 3) in which a total of 623 patients received 2403 mg/day of ESBRIET and 624 patients received placebo. Subjects ages ranged from 40 to 80 years (mean age of 67 years). Most patients were male (74%) and Caucasian (95%). The mean duration of exposure to ESBRIET was 62 weeks (range: 2 to 118 weeks) in these 3 trials. 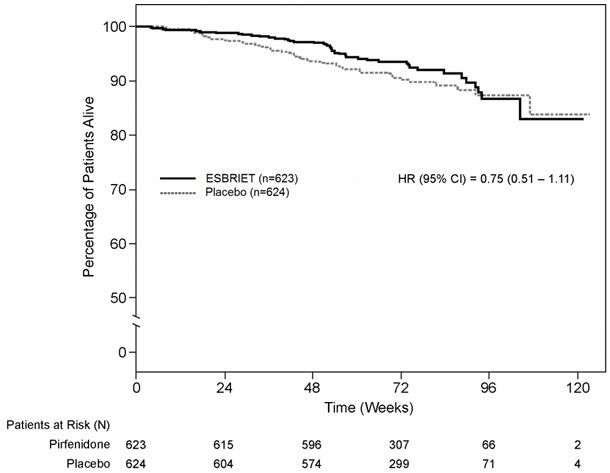 At the recommended dosage of 2403 mg/day, 14.6% of patients on ESBRIET compared to 9.6% on placebo permanently discontinued treatment because of an adverse event. The most common (>1%) adverse reactions leading to discontinuation were rash and nausea. The most common (>3%) adverse reactions leading to dosage reduction or interruption were rash, nausea, diarrhea, and photosensitivity reaction. The most common adverse reactions with an incidence of ≥10% and more frequent in the ESBRIET than placebo treatment group are listed in Table 2. 1 Includes abdominal pain, upper abdominal pain, abdominal distension, and stomach discomfort. Adverse reactions occurring in ≥5 to <10% of ESBRIET-treated patients and more commonly than placebo are photosensitivity reaction (9% vs. 1%), decreased appetite (8% vs. 3%), pruritus (8% vs. 5%), asthenia (6% vs. 4%), dysgeusia (6% vs. 2%), and non-cardiac chest pain (5% vs. 4%). In addition to adverse reactions identified from clinical trials the following adverse reactions have been identified during postapproval use of pirfenidone. Because these reactions are reported voluntarily from a population of uncertain size, it is not always possible to reliably estimate their frequency. Pirfenidone is metabolized primarily (70 to 80%) via CYP1A2 with minor contributions from other CYP isoenzymes including CYP2C9, 2C19, 2D6 and 2E1. The concomitant administration of ESBRIET and fluvoxamine or other strong CYP1A2 inhibitors (e.g., enoxacin) is not recommended because it significantly increases exposure to ESBRIET [see Clinical Pharmacology (12.3)]. Use of fluvoxamine or other strong CYP1A2 inhibitors should be discontinued prior to administration of ESBRIET and avoided during ESBRIET treatment. In the event that fluvoxamine or other strong CYP1A2 inhibitors are the only drug of choice, dosage reductions are recommended. Monitor for adverse reactions and consider discontinuation of ESBRIET as needed [see Dosage and Administration (2.4)]. Concomitant administration of ESBRIET and ciprofloxacin (a moderate inhibitor of CYP1A2) moderately increases exposure to ESBRIET [see Clinical Pharmacology (12.3)]. If ciprofloxacin at the dosage of 750 mg twice daily cannot be avoided, dosage reductions are recommended [see Dosage and Administration (2.4)]. Monitor patients closely when ciprofloxacin is used at a dosage of 250 mg or 500 mg once daily. Agents or combinations of agents that are moderate or strong inhibitors of both CYP1A2 and one or more other CYP isoenzymes involved in the metabolism of ESBRIET (i.e., CYP2C9, 2C19, 2D6, and 2E1) should be discontinued prior to and avoided during ESBRIET treatment. The concomitant use of ESBRIET and a CYP1A2 inducer may decrease the exposure of ESBRIET and this may lead to loss of efficacy. Therefore, discontinue use of strong CYP1A2 inducers prior to ESBRIET treatment and avoid the concomitant use of ESBRIET and a strong CYP1A2 inducer [see Clinical Pharmacology (12.3)]. There are no adequate and well-controlled studies of ESBRIET in pregnant women. Pirfenidone was not teratogenic in rats and rabbits. Because animal reproduction studies are not always predictive of human response, ESBRIET should be used during pregnancy only if the benefit outweighs the risk to the patient. A fertility and embryo-fetal development study with rats and an embryo-fetal development study with rabbits that received oral doses up to 3 and 2 times, respectively, the maximum recommended daily dose (MRDD) in adults (on mg/m2 basis at maternal doses up to 1000 and 300 mg/kg/day, respectively) revealed no evidence of impaired fertility or harm to the fetus due to pirfenidone. In the presence of maternal toxicity, acyclic/irregular cycles (e.g., prolonged estrous cycle) were seen in rats at doses approximately equal to and higher than the MRDD in adults (on a mg/m2 basis at maternal doses of 450 mg/kg/day and higher). In a pre- and post-natal development study, prolongation of the gestation period, decreased numbers of live newborn, and reduced pup viability and body weights were seen in rats at an oral dosage approximately 3 times the MRDD in adults (on a mg/m2 basis at a maternal dose of 1000 mg/kg/day). A study with radio-labeled pirfenidone in rats has shown that pirfenidone or its metabolites are excreted in milk. It is not known whether ESBRIET is excreted in human milk. Because many drugs are excreted in human milk and because of the potential for serious adverse reactions in nursing infants, a decision should be made whether to discontinue nursing or to discontinue ESBRIET, taking into account the importance of the drug to the mother. Safety and effectiveness of ESBRIET in pediatric patients have not been established. Of the total number of subjects in the clinical studies receiving ESBRIET, 714 (67%) were 65 years old and over, while 231 (22%) were 75 years old and over. No overall differences in safety or effectiveness were observed between older and younger patients. No dosage adjustment is required based upon age. ESBRIET should be used with caution in patients with mild (Child Pugh Class A) to moderate (Child Pugh Class B) hepatic impairment. Monitor for adverse reactions and consider dosage modification or discontinuation of ESBRIET as needed [see Dosage and Administration (2.2)]. The safety, efficacy, and pharmacokinetics of ESBRIET have not been studied in patients with severe hepatic impairment. ESBRIET is not recommended for use in patients with severe (Child Pugh Class C) hepatic impairment [see Clinical Pharmacology (12.3)]. ESBRIET should be used with caution in patients with mild (CLcr 50–80 mL/min), moderate (CLcr 30–50 mL/min), or severe (CLcr less than 30 mL/min) renal impairment [see Clinical Pharmacology (12.3)]. Monitor for adverse reactions and consider dosage modification or discontinuation of ESBRIET as needed [see Dosage and Administration (2.3)]. The safety, efficacy, and pharmacokinetics of ESBRIET have not been studied in patients with end-stage renal disease requiring dialysis. Use of ESBRIET in patients with end-stage renal diseases requiring dialysis is not recommended. Smoking causes decreased exposure to ESBRIET [see Clinical Pharmacology (12.3)], which may alter the efficacy profile of ESBRIET. Instruct patients to stop smoking prior to treatment with ESBRIET and to avoid smoking when using ESBRIET. There is limited clinical experience with overdosage. Multiple dosages of ESBRIET up to a maximum tolerated dose of 4005 mg per day were administered as five 267 mg capsules three times daily to healthy adult volunteers over a 12-day dose escalation. In the event of a suspected overdosage, appropriate supportive medical care should be provided, including monitoring of vital signs and observation of the clinical status of the patient. Each ESBRIET capsule contains 267 mg of pirfenidone, which belongs to the chemical class of pyridone. ESBRIET is available as a white hard gelatin capsule for oral administration. Pirfenidone is a white to pale yellow, non-hygroscopic powder. It is more soluble in methanol, ethyl alcohol, acetone and chloroform than in water and 1.0 N HCl. The melting point is approximately 109°C. ESBRIET capsule contains pirfenidone and the following inactive ingredients: microcrystalline cellulose, croscarmellose sodium, povidone, and magnesium stearate. In addition, the capsule shell contains gelatin and titanium dioxide. The capsule brown printing ink includes shellac, iron oxide black, iron oxide red, iron oxide yellow, propylene glycol, ammonium hydroxide. The mechanism of action of pirfenidone in the treatment of IPF has not been established. The effect of ESBRIET on QT interval was evaluated in a randomized, placebo, and positive controlled parallel study in 160 healthy adult volunteers. Volunteers received ESBRIET 2403 mg/day (recommended dose) and 4005 mg/day (1.6 times recommended dose) or placebo for 10 days or a single dose of 400 mg moxifloxacin (active control). Relative to placebo, the maximum mean change from baseline in study-specific QT interval was 3.2 milliseconds (ms) and 2.2 ms for ESBRIET 2403 mg/day and 4005 mg/day, respectively. No volunteer had a QTc interval greater than 480 ms or change from baseline greater than 60 ms. Although there was no evidence that ESBRIET prolonged the QTc interval in this study, a definitive conclusion may not be drawn as the positive control (moxifloxacin) did not perform as expected in this study, and ESBRIET at 4005 mg/day (1.7 times the maximum recommended dose) did not cover the maximum pirfenidone exposure increase with co-administration of fluvoxamine, a strong CYP1A2 inhibitor. After single oral-dose administration of 801 mg ESBRIET, the maximum observed plasma concentration (Cmax) was achieved between 30 minutes and 4 hours (median time of 0.5 hours). Food decreased the rate and extent of absorption. Median Tmax increased from 0.5 hours to 3 hours with food. Maximum plasma concentrations and AUC0-inf decreased by approximately 49% and 16% with food, respectively. A reduced incidence of adverse reactions was observed in the fed group when compared to the fasted group. In controlled studies with IPF patients, ESBRIET was taken with food [see Dosage and Administration (2) and Clinical Studies (14)]. The absolute bioavailability of pirfenidone has not been determined in humans. ESBRIET binds to human plasma proteins, primarily to serum albumin, in a concentration-independent manner over the range of concentrations observed in clinical trials. The overall mean binding was 58% at concentrations observed in clinical studies (1 to 10 µg/mL). Mean apparent oral volume of distribution is approximately 59 to 71 liters. In vitro profiling studies in hepatocytes and liver microsomes have shown that ESBRIET is primarily metabolized in the liver by CYP1A2 and multiple other CYPs (CYP2C9, 2C19, 2D6, and 2E1). Oral administration of ESBRIET results in the formation of four metabolites. In humans, only pirfenidone and 5-carboxy-pirfenidone are present in plasma in significant quantities. The mean metabolite-to-parent ratio ranged from approximately 0.6 to 0.7. No formal radiolabeled studies have assessed the metabolism of pirfenidone in humans. In vitro data suggests that metabolites are not expected to be pharmacologically active at observed metabolite concentrations. The mean terminal half-life is approximately 3 hours in healthy subjects. Pirfenidone is excreted predominantly as metabolite 5-carboxy-pirfenidone, mainly in the urine (approximately 80% of the dose). The majority of ESBRIET was excreted as the 5-carboxy metabolite (approximately 99.6% of that recovered). The pharmacokinetics of ESBRIET and the 5-carboxy-pirfenidone metabolite were studied in 12 subjects with moderate hepatic impairment (Child Pugh Class B) and in 12 subjects with normal hepatic function. Results showed that the mean exposure, AUC0-inf and Cmax of pirfenidone increased approximately 1.6- and approximately 1.4-fold in subjects with moderate hepatic impairment, respectively. The exposure of 5-carboxy-pirfenidone did not change significantly in subjects with moderate hepatic impairment. The pharmacokinetics of pirfenidone and the 5-carboxy-pirfenidone metabolite were studied in 18 subjects with mild (CLcr 50 to 80 mL/min), moderate (CLcr 30 to 50 mL/min), and severe (CLcr less than 30 mL/min) renal impairment (n=6/group) and in 6 subjects with normal CLcr (greater than or equal to 80 mL/min) renal function. Results showed that systemic exposure (AUC0-inf) to pirfenidone increased approximately 1.4, 1.5, and 1.2-fold in subjects with mild, moderate and severe renal impairment, respectively. The corresponding AUC0-inf of 5-carboxy-pirfenidone increased 1.7, 3.4, and 5.6-fold, although the change in the patients with mild renal impairment was not statistically significant. The renal clearance of 5-carboxy-pirfenidone decreased significantly in patients with moderate to severe renal impairment. The pharmacokinetics and safety of ESBRIET has not been studied in subjects with end-stage renal disease requiring dialysis. Results of population pharmacokinetic analysis suggest that no dosage adjustment is needed in geriatric patients. Results of population pharmacokinetic analysis of ESBRIET showed no significant differences in pharmacokinetics between males and females. Results of population pharmacokinetic analysis showed that obesity (Body Mass Index [BMI] greater than or equal to 30 kg/m2) has no significant effect on the pharmacokinetics of ESBRIET. Population pharmacokinetic analysis showed that race has no significant effect on the pharmacokinetics of pirfenidone. Pirfenidone is a substrate of cytochrome P450 1A2. In a single-dose drug interaction study in 25 healthy nonsmokers and 25 smokers, ESBRIET was coadministered with fluvoxamine (50 mg at bedtime for 3 days; 50 mg twice a day for 3 days, and 50 mg in the morning and 100 mg at bedtime for 4 days). An approximately 4-fold increase in exposure to pirfenidone in nonsmokers and approximately 7-fold increase in exposure in smokers was observed. In a single-dose drug interaction study in 27 healthy subjects, coadministration of 801 mg of ESBRIET and 750 mg of ciprofloxacin (a moderate inhibitor of CYP1A2) on Day 6 (ciprofloxacin was dosed at 750 mg twice daily from Day 2 to Day 7) increased the exposure to pirfenidone by 81%. Following a single oral dose of 801 mg ESBRIET in 25 smokers and 25 healthy nonsmokers, the systemic exposure in smokers was significantly lower compared to nonsmokers. AUC0-inf and Cmax of pirfenidone in smokers were 46% and 68% of those in nonsmokers, respectively. The potential for pirfenidone to inhibit Pgp mediated transport of digoxin (5.0 µM) was evaluated in the absence and presence of pirfenidone at concentrations ranging from 1 to 1000 µM in in vitro system. Pirfenidone showed weak inhibition (10 to 30%) of Pgp facilitated digoxin B-A efflux at concentrations of 100 µM and above. Effect of pirfenidone upon Pgp substrate pharmacokinetics and safety has not been evaluated in humans. The potential for pirfenidone to inhibit CYP2C9, 2C19 or 1A2 was evaluated in vitro at concentrations up to 1000 µM (approximately 10-fold the mean human Cmax). Pirfenidone showed a concentration-dependant inhibition on CYP2C9, 2C19 or 1A2, 2D6, and 3A4. At 1000 µM, pirfenidone inhibits the activity of these enzymes by 30.4%, 27.5%, 34.1%, 21%, and 9.6%, respectively. Effect of pirfenidone upon pharmacokinetics and safety of CYP2C9, 2C19, 1A2, 2D6, and 3A4 substrates has not been evaluated in humans. Long-term studies were conducted in mice and rats with admixture of pirfenidone to the diet to evaluate its carcinogenic potential. In a 24-month carcinogenicity study in B6C3F1 mice, pirfenidone caused statistically significant dose-related increases of the combination of hepatocellular adenoma and carcinoma and hepatoblastoma in male mice at doses of 800 mg/kg and above (AUC exposure approximately 0.4 times adult exposure at the MRDD). There were statistically significant dose-related increases of the combination of hepatocellular adenoma and carcinoma in female mice at doses of 2000 mg/kg and above (AUC exposure approximately 0.7 times adult exposure at the MRDD). In a 24-month carcinogenicity study in Fischer rats, pirfenidone caused statistically significant dose-related increases of the combination of hepatocellular adenoma and carcinoma in male rats at doses of 750 mg/kg and above (AUC exposure approximately 1.9 times adult exposure at the MRDD). There were statistically significant increases of the combination of hepatocellular adenoma and carcinoma and the combination of uterine adenocarcinoma and adenoma at a dose of 1500 mg/kg/day (AUC exposure approximately 3.0 times adult exposure at the MRDD). The relevance of these tumor findings in rodents to humans is unknown. Pirfenidone was not mutagenic or clastogenic in the following tests: mutagenicity tests in bacteria, a chromosomal aberration test in Chinese hamster lung cells, and a micronucleus test in mice. Pirfenidone had no effects on fertility and reproductive performance in rats at dosages up to 1000 mg/kg/day (approximately 3 times the MRDD in adults on a mg/m2 basis). The efficacy of ESBRIET was evaluated in patients with IPF in three phase 3, randomized, double-blind, placebo-controlled, multicenter trials (Studies 1, 2, and 3). Studies 1, 2 and 3 enrolled adult patients who had a clinical and radiographic diagnosis of IPF (with or without accompanying surgical lung biopsy), without evidence or suspicion of an alternative diagnosis for interstitial lung disease. Eligible patients were to have %FVC greater than or equal to 50% at baseline and a percent predicted diffusing capacity of the lungs for carbon monoxide (%DLCO) greater than or equal to 30% (Study 1) or 35% (Studies 2 and 3) at baseline. In all three trials, over 80% of patients completed study treatment. A total of 1247 patients with IPF were randomized to receive ESBRIET 2403 mg/day (n=623) or placebo (n=624) in these three trials. Baseline characteristics were generally balanced across treatment groups. The study population ranged from 40 to 80 years of age (mean age 67 years). Most patients were male (74%), white (95%), and current or former smokers (65%). Approximately 93% of patients met criteria for definite IPF on high resolution computed tomography (HRCT). Baseline mean %FVC and %DLCO were 72% and 46%, respectively. Approximately 15% subjects discontinued from each treatment group. 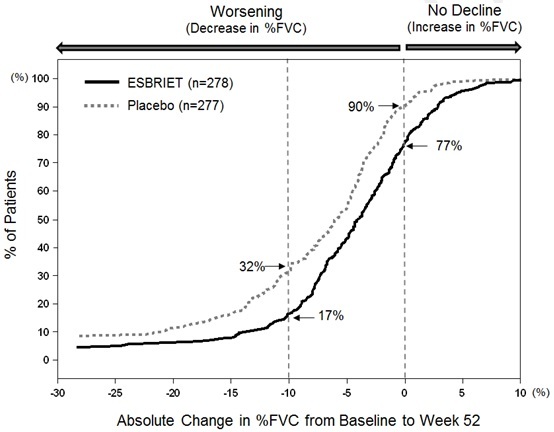 In Study 1, the primary efficacy analysis for the change in %FVC from baseline to Week 52 demonstrated a statistically significant treatment effect of ESBRIET 2403 mg/day (n=278) compared with placebo (n=277) using a rank ANCOVA with the lowest rank imputation for missing data due to death. In Study 2, there was a statistically significant difference at Week 72 for the change in %FVC from baseline. In Study 3, there was no statistically significant difference at Week 72 for the change in %FVC from baseline. Figure 1 presents the cumulative distribution for all cut-offs for the change from baseline in %FVC at Week 52 for Study 1. For all categorical declines in lung function, the proportion of patients declining was lower on ESBRIET than on placebo. Study 2 showed similar results. Figure 1. Cumulative Distribution of Patients by Change in Percent Predicted FVC from Baseline to Week 52 (Study 1). The Dashed Lines Indicate ≥10% Decline or ≥0% Decline. 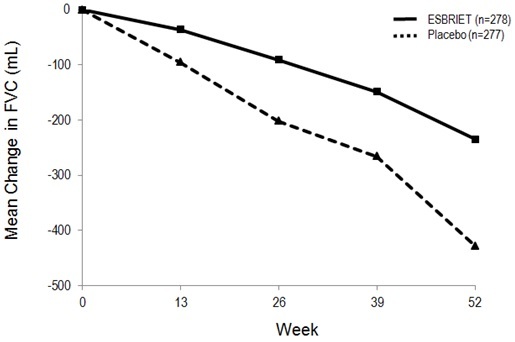 In Study 1, a reduction in the mean decline in FVC (in mL) was observed in patients receiving ESBRIET 2403 mg/day (-235 mL) compared to placebo (-428 mL) (mean treatment difference 193 mL) at Week 52 (see Figure 2). In Study 2, a reduction in the decline in FVC volume was also observed in patients receiving ESBRIET 2403 mg/day compared with placebo (mean treatment difference 157 mL) at Week 72. There was no statistically significant difference in decline in FVC volume seen in Study 3. Survival was evaluated for ESBRIET compared to placebo in Studies 1, 2, and 3 as an exploratory analysis to support the primary endpoint (FVC). All-cause mortality was assessed over the study duration and available follow-up period, irrespective of cause of death and whether patients continued treatment. All-cause mortality did not show a statistically significant difference (see Figure 3). ESBRIET is a white hard gelatin capsule; each capsule contains 267 mg of pirfenidone. The cap of the capsule is printed with “InterMune®” and “267 mg” in brown ink. The capsule is supplied either in a bottle, a 14-day titration blister pack or a 4-week maintenance blister pack. Keep the bottle tightly closed. Do not use if the seal over the bottle opening is broken or missing. Advise patients that they may be required to undergo liver function testing periodically. Instruct patients to immediately report any symptoms of a liver problem (e.g., skin or the white of eyes turn yellow, urine turns dark or brown [tea colored], pain on the right side of stomach, bleed or bruise more easily than normal, lethargy) [see Warnings and Precautions (5.1)]. Advise patients to avoid or minimize exposure to sunlight (including sunlamps) during use of ESBRIET because of concern for photosensitivity reactions or rash. Instruct patients to use a sunblock and to wear clothing that protects against sun exposure. Instruct patients to report symptoms of photosensitivity reaction or rash to their physician. Temporary dosage reductions or discontinuations may be required [see Warnings and Precautions (5.2)]. Instruct patients to report symptoms of persistent gastrointestinal effects including nausea, diarrhea, dyspepsia, vomiting, gastro-esophageal reflux disease, and abdominal pain. Temporary dosage reductions or discontinuations may be required [see Warnings and Precautions (5.3)]. Encourage patients to stop smoking prior to treatment with ESBRIET and to avoid smoking when using ESBRIET [see Clinical Pharmacology (12.3)]. Instruct patients to take ESBRIET with food to help decrease nausea and dizziness. 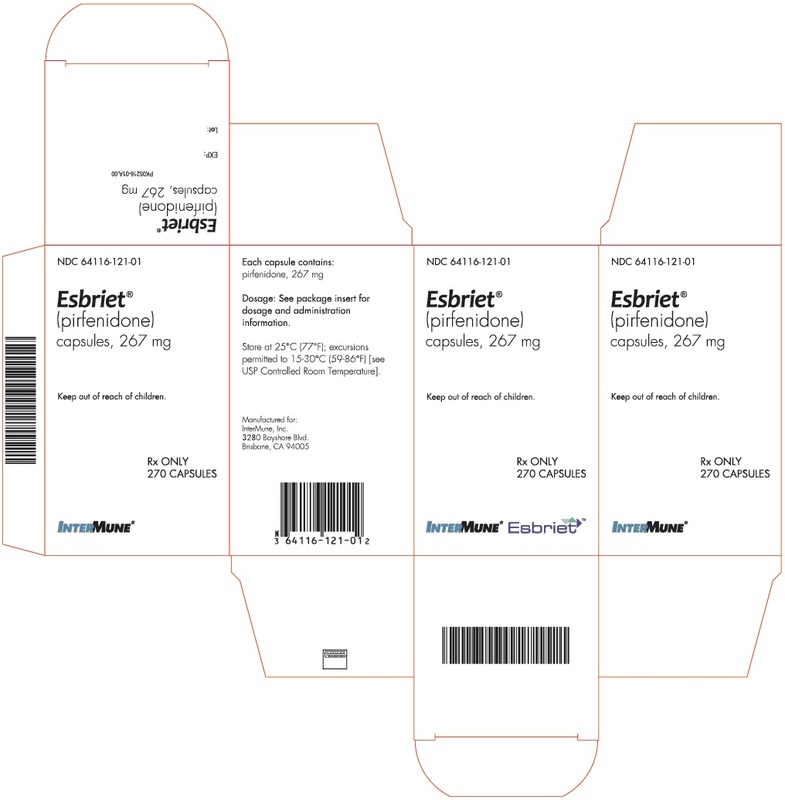 ESBRIET is a registered U.S. trademark of InterMune, Inc.
Read this Patient Information before you start taking ESBRIET and each time you get a refill. There may be new information. This information does not take the place of talking to your doctor about your medical condition or your treatment. What should I tell my doctor before taking ESBRIET? are pregnant or plan to become pregnant. It is not known if ESBRIET will harm your unborn baby. are breastfeeding or plan to breastfeed. It is not known if ESBRIET passes into your breast milk. You and your doctor should decide if you will take ESBRIET or breastfeed. How should I take ESBRIET? Take ESBRIET exactly as your doctor tells you to take it. Your doctor may change your dosage of ESBRIET as needed. Take ESBRIET with food. This may help to decrease nausea and dizziness. Take 1 ESBRIET capsule 3 times each day for days 1 through 7. Take 2 ESBRIET capsules 3 times each day for days 8 through 14. Take 3 ESBRIET capsules 3 times each day on day 15 and each day after. If you miss a dose of ESBRIET take your next dose as soon as you remember. Do not take 2 doses at the same time to make up for your missed dose. Do not more than 3 doses each day. If you take too much ESBRIET, call your doctor or go to the nearest hospital emergency room right away. Your doctor should do certain blood tests before you start taking ESBRIET. What should I avoid while taking ESBRIET? Avoid sunlight. ESBRIET can make your skin sensitive to the sun and the light from sunlamps and tanning beds. You could get a severe sunburn. Use sunscreen (SPF50) and wear a hat and clothes that cover your skin if you have to be in sunlight. Talk to your doctor if you get sunburn. Avoid smoking. Smoking may affect how well ESBRIET works. Your doctor will do blood tests to check how your liver is working during your treatment with ESBRIET. stomach problems. ESBRIET may cause stomach problems such as nausea, vomiting, diarrhea, indigestion, heartburn, and stomach pain. Tell your doctor right away if your stomach problems get worse or do not go away. Your doctor may need to change your dose of ESBRIET. The most common side effects of ESBRIET include feeling tired, headache, dizziness and decreased or loss of appetite. These are not all the possible side effects of ESBRIET. For more information, ask your doctor or pharmacist. How should I store ESBRIET? Store ESBRIET at room temperature between 68°F to 77°F (20°C to 25°C). Keep in a tightly closed container. Safely throw away any ESBRIET that is out of date or no longer needed. Keep ESBRIET and all medicines out of reach of children. General information about the safe and effective use of ESBRIET. Medicines are sometimes prescribed for purposes other than those listed in a Patient Information leaflet. This Patient Information leaflet summarizes the most important information about ESBRIET. If you would like more information, talk to your doctor. You can ask your pharmacist or doctor for information about ESBRIET that is written for health professionals. For more information, go to www.ESBRIET.com or call 1-888-486-6411. What are the ingredients in ESBRIET?